The Church of Yahushua (Jesus) was originally in charge of health and healing. In this teaching, Bill reveals the conspiratorial origins of modern American (pharmaceutical) medicine: how the ruling elite stole medicine from the church and set up a licensed monopoly. He shows how this monopoly seems to be actually bent on reducing the population and gaining in power by withholding cures. He exposes the Iron Triangle: how the FDA, the drug companies and medical schools collude together to control and destroy our nation's health. Bill discusses natural, gentle, Divinely-provided alternatives which we can use to achieve optimal wellness, without sorcery (pharmakaeia or pharmacy)! 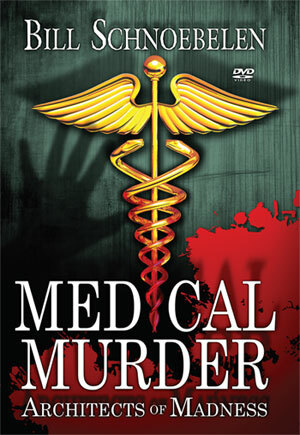 This new DVD by author and Biblical apologist William Schnoebelen exposes the pharmaceutical industry's growing control and manipulation of our health care system to make billions of dollars every year. Using psychiatric drugs with devastating results, this ever-growing 'Pharmacyde' of Americans continues to enslave and murder the sick and dying for profit. Bill teaches how and why the church needs to take back its rightful and anointed place as the healing hands of the Father!